As single-use technology has become more established in biopharmaceutical manufacturing it has been applied to more and more complex unit operations involving higher value products. This has driven the need for greater process control and the use of single-use automation has grown. But why has automation not been more widely adopted in single-use processes and what benefits can be realized? So, if automation of single-use steps is key, what is stopping its implementation? 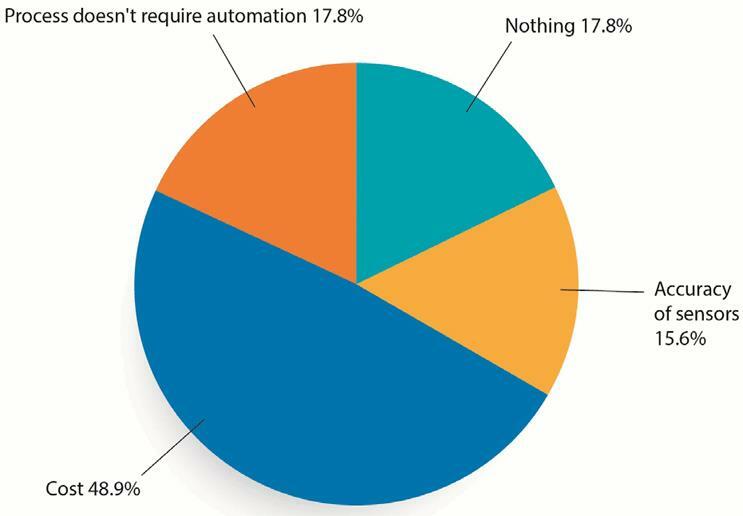 In a recent survey conducted during a Parker webinar the audience was asked What would restrict you from implementing automation in your single-use process? The results shown in the pie chart below were observed. Almost 20 percent of the respondents stated the process does not require automation. Given that automation enhances safety, can improve efficiency of a process and, if nothing else, frees up operators from passively watching a process to be able to carry out more value-added activities, it could be argued that all processes could benefit from some level of automation. Accuracy of sensors was called out by 15 percent of respondents. 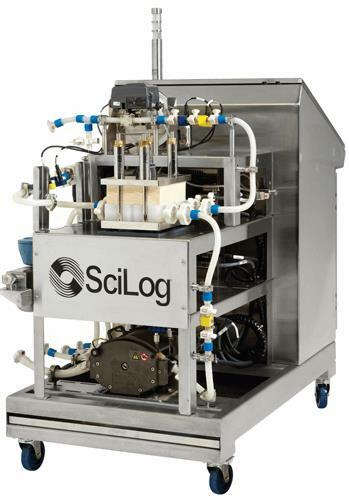 Looking into this we see sensor accuracy of +/- 0.02 bar being achieved by SciLog® SciPres® single-use in-line pressure sensors. The use of three point calibration to fully traceable NIST (National Institute of Standards and Technology) standard should further raise confidence in the device being used1. Cost was reported by nearly 50 percent of respondents as the reason why they would not implement automation. It should be acknowledged that putting an automated system in place does incur cost, but this should be seen as an investment. 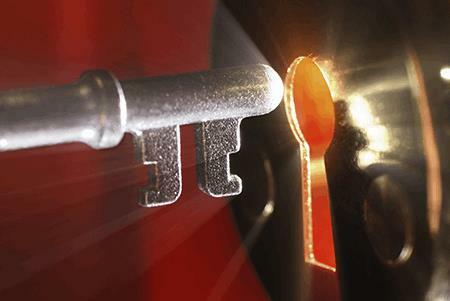 The reward for this investment has been seen in the form of time saving, complexity reduction, improved process security and predictability as well as standardized training. This all adds up to a rapid return on investment. In fact in one study Parker completed, the time to demonstrate a return on investment was less than 12 months2. Having discussed some of the barriers to automation in single-use, we need to look at the reasons in favour. To illustrate why you would implement automation in single-use, we should look at the key drivers in the biopharmaceutical industry and how they are addressed by single- use automation. These answers could equally be applied to the question Why implement single-use technology? As both are closely linked, single-use system implementation and single-use automation should be viewed jointly, with automation taking the advantage gained from single-use to a higher level. Speed to market: Automation can address speed to market in a number of ways. If the same technology on the same automation platform has been used across the development process as will be used at scale, the scale- up will be easier to complete and more predictable when compared to that which uses multiple automation platforms. Having access to the same equipment and product contact materials can greatly ease technical transfers by eliminating a number of variables from the process, not to mention simplified validation and extractables & leachables data. An automated single-use system can be ordered, shipped and validated in far less time than its stainless steel equivalent. Investment Decisions: These can be delayed. If it takes five years to build and validate a multi-use (CIP/SIP) facility but only two for the equivalent single-use facility, you can have three years’ worth of extra data before pushing the button on what would be a multimillion dollar investment. Multi-Product Facilities: Facilities of the future need to be capable of making more than one product. Single-use has clear advantages in a multi-product facility, namely not having to validate CIP/SIP cycles and maintain costly utilities. Automation takes this to the next level as it allows operators to run recipe driven processes even when they have limited experience of the process being run. All TFF processes follow a certain hight level routine but products will have differences in the recipe. Being able to call up and run an automated process helps to eliminate process errors. Regulatory: Products need to be safe and effective, and processes need to be robust and repeatable. The more automated a process is, the more repeatable that unit of operation should be, subject to a constant feed stream. Automation will also contribute to simplified training and reduction in operator driven deviations. Additionally, an automated system allows for the creation of a batch record along with the compliant storage and audit trail for the data easing the lot review process. Economic: With biosimilars coming on line, more and more focus is placed on cost of goods (COG’s). How does spending money on putting in an automated platform aid the lowering of COG’s? Simply put: by making the process more repeatable, standardized and robust, you increase the predictability of the process. Through automation, you can decrease the number of people involved in a unit operation and simplify the supply chain around the process. In effect, you can do more with less. Continuous Processing: Bringing together two biggest trends in biomanufacturing, continuous processing will be or, in some cases, is the next big thing to hit the bioprocessing world. The benefits of single-use are so great that it would be difficult to see why you would switch back to a fixed platform. So, to allow continuous processing of single-use processes, the automation of valves, feedback from sensors and control logic will need to be in place. Or to put it another way, single-use continuous manufacturing processes will need an automated approach if it is going to work. When discussing normal flow filtration (NFF) on a single-use platform, an experienced operator will remember a manual intervention of turning down a pump speed when a line started to balloon because of a pressure build up. The first step in process automation came with a pressure sensor linked to a display so the pressure could be read from a monitor. Next was linking this to an alarm to alert the operator and the next level of automation would monitor the dP and switch off the pump once a trigger point had been reached. Finally, we are able to see the full benefit of automation for this step by using the R/P Stat method. R/P Stat is an automated method for controlling NFF that can improve filter capacity by up to 30 percent. It works by controlling the pump speed based on the measurement of dP. The process starts running at a set speed and pressure is monitored. As the pressure builds up over time, instead of reaching a trigger point for pressure and switching the pump off, the pump speed is reduced to prevent the dP building to a point that would trigger a process stop. By running in this fashion, the process can run for longer (see graph below). A smaller filter can potentially be used as the safety margin on the surface area need not be as great. It is easier to handle unpredictable feed streams, for example, harvesting cell cultures in process development laboratories where the cell density, cell viability and productivity can vary widely batch to batch. If we were to look at a more complex operation like tangential flow filtration (TFF) there are a number of inputs to be monitored and controlled and a range of outputs that could trigger the end point. Volume or mass related process end points points are relatively easy to control based on measurements from a load cell. Through monitoring a change in volume, by measuring weight, process decisions can be made. Obtaining a particular mass in the retentate tank during a concentration step would indicate that a certain concentration factor has been reached. Alternatively, during a diafiltration step, reaching a set point on the permeate side would indicate that the required number of diavolumes have been processed. 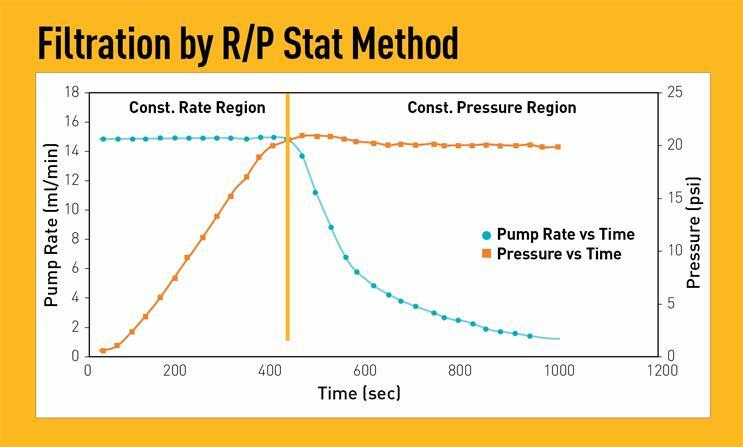 Process decisions involving pressure are more complex as pressure is a function of the pump speed and pressure control valves. However, through automation this balance can be achieved, for example, to maintain a set dP or TMP in the process. The system will open and close valves and increase or decrease pump speed based on the programming logic to maintain the required set points but also the required process conditions, such as cross flow rates, to maintain a shear rate in a hollow fibre. It would be impossible to manually take a reading from three pressure sensors, two pumps and a couple of balances every second over a four hour period while at the same time calculating dP and / or TMP then adjusting the system to maintain a set point. Through automation, this level of data capture and process control is possible. The other major advantages of an automated process is the generation of a data set that is unambiguous, has the capacity to be copied without error, can be stored in multiple places, has an audit trail of changes and can be downloaded easily for analysis without error. Also, unless you have the original data to compare against, you have no way of knowing if that data is correct, whereas an automated system will have a verified batch record. Single-use technology is a key enabling technology allowing facility utilization to be optimized and facilities to be multi-product while driving down COG’s. This allows more people to access lifesaving biopharmaceuticals. Without automation, these single-use systems would have limited application, but through automation, it is possible to achieve data acquisition, process monitoring and control, and batch record generation, so allowing more complex unit operations to be run in cGMP compliant production environments. As a result, the true value of single-use technology can be realized. Guy Matthews has worked in the biopharm industry for the last 20 years starting his career as a scientist at a well-known CMOin the UK before moving to more commercial roles. During this time he has been involved in many projects implementing single-use technology in both upstream and downstream bioprocessing. Guy now works as market development manager (life sciences) for Parker Bioscience where he is focused on bringing Parker’s expertise in motion and control to bioprocessing to create robust solutions in single-use technology that enable customers to improve the quality and accessibility of biopharmaceuticals.